We got going early today and filmed Alinghi and BMW Oracle from the water. A very nice guy offered to take us around the port in his new 60 footer. We even sailed for about 40 minutes on the way back from the commercial port where BMW Oracle is berthed. We saw BMW Oracle up close with the wing up as it lay on its mooring. (Pictures) The boat sails around in a 100 foot arc. The wind piped up just after we left and both teams scraped their plans to go out for a short sail. We had 30 knots on the masthead of our little 60 footer's mast at 80 feet so imagine what wind speed they would have had at 224' up? 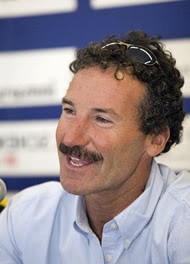 The World Sailing Teams Association had a lunch with some journalists. We explained our goals and schedule for 2010. Our next Louis Vuitton Trophy event will be in Auckland in early March. I then found time to go for a run along Malva Rosa beach again and then had dinner with some very good friends from San Francisco, the Doug and Laurel Holm. We ate in a great fish restaurant that is so quaint that you ring a bell and then they let you in if you have a reservation. There is no sign on the outside of the building. Tomorrow's forecast is not great....a lot of wind. In fact, the race committee already announced the first delay tonight by postponing the start time to no earlier than noon. The breeze is supposed to drop during the day but it will take a while for the sea to come down. We will see but it is not starting well.